If you haven’t come to one of our meetups now is the perfect time to start coming! And we look forward to reconnecting with all our friends who have been joining us monthly in the past! JANUARY’S SESSION: will have a guest speaker flying down from San Francisco just for us! We are starting to see many multifamily properties convert to Tenant in Common properties TICs in Los Angeles. They could be a great opportunity yet its almost impossible to find someone to lend on them. WE FOUND SOMEONE AND THEY WILL BE SPEAKING AT OUR MEETUP! Come meet them Saturday January 12th! 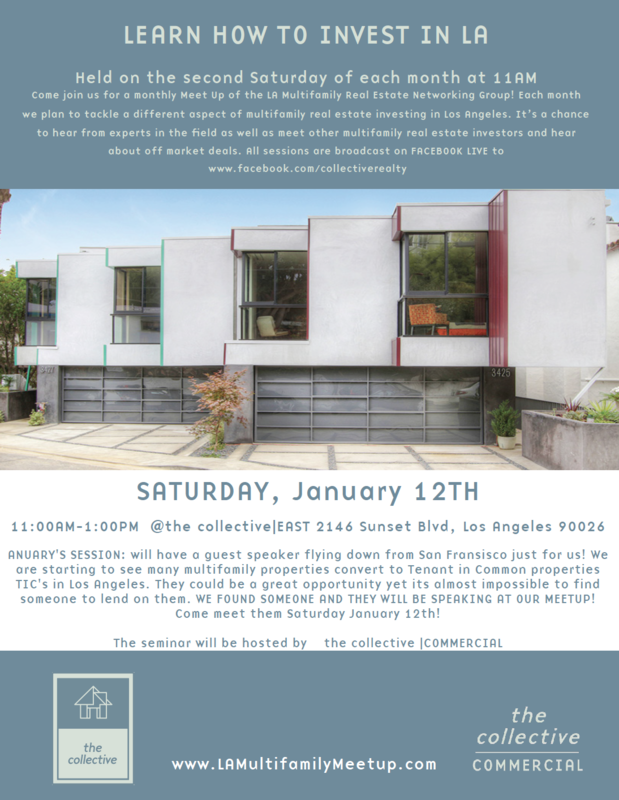 Join us for the monthly Meet Up of the LA Multifamily Real Estate Networking Group! Each month we hope to tackle a different aspect of multifamily real estate investing in Los Angeles. It’s a chance to hear from experts in the field as well as network with other multifamily real estate investors and hear about off market deals. Every session, Will Tiao of Tiao Properties will go over different deals that are currently on the market in various parts of the City, including basics such as how to analyze rates of return. Will is also going to go over some of the issues to expect once you close a deal with regards to property management.